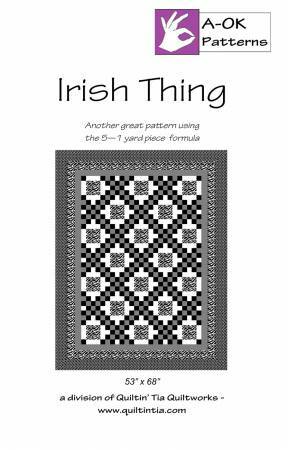 Quilt measures 52in x 68in We created a twist on the classic Irish Chain pattern to fit the A OK five yard formula. Strip piecing make block construction faster and easier. Using the five finger method, you will choose the correct fabrics every time. Our A OK patterns are printed in greyscale, allowing each quilter to determine which fabrics will make a kit. Bundle five yards and allow customers to choose the A OK pattern that meets their level of skill. Any bundle will work with any A OK pattern (5 pages).